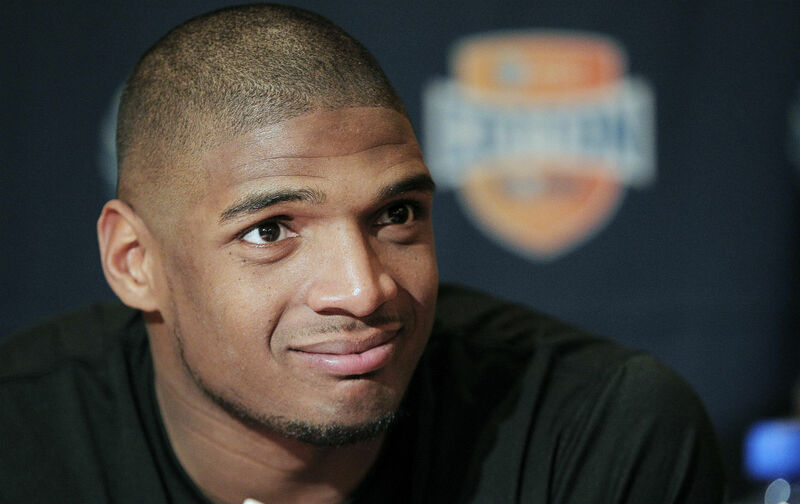 Michael Sam’s need to sign with the Canadian Football League’s Montral franchise shames the NFL but could be the perfect place for Sam to show what he can do. The connection between Michael Sam and Jackie Robinson is even more illustrative. There’s an old expression from Mark Twain that I tend to overuse: “History does not repeat itself, but it does rhyme.” Last year, I worked this phrase like a government mule because it seemed to fit Michael Sam’s odyssey to the NFL so well. No, he wasn’t Jackie Robinson aiming to break the color line in 1947 and the differences in their journeys cannot be ignored. Most obviously, the overcoming of the obstacles of race and sexuality have significant historical deviations. In addition, Robinson was attempting to break through in advance of a civil-rights movement, which is why Dr. King described him years later as “a sit-inner before sit-ins, a freedom rider before freedom rides.” Michael Sam is coming to the NFL after decades of LGBT people fighting to be open in both the workplace and the world. If sports was ahead of the curve on racial issues, on sexuality it has long lagged in both men’s and women’s sports. The differences are real, but the similarities however have been too glaring to ignore. Michael Sam was going to have the burden of being "a first". His journey would be chronicled extensively and in turn force a lot of people who did not want to think about the issues LGBT people face, to acknowledge their existence. This sounds a great deal like the effect Jackie Robinson had on the country in the arena of race. Even the excuses long used to discourage LGBT athletes from coming out were common to the old color line: the shower and the locker room. Just as white athletes had to get over their irrational prejudice over sharing showers, we would see resistant football player – both straight and those grappling with their own sexuality – doing the same. Then there was the trope of “the distraction”: teams saying that it was less about prejudice than not wanting to deal with the uproar. History rhymes up a storm on that one. Unfortunately, Michael Sam did not have his Branch Rickey: the NFL executive who decided come hell or high water that this was going to happen. Yes, even if Rickey’s reasons were often less about social justice than the future value of the franchise, he should always get credit for persevering when his fellow owners told him to stand down. Michael Sam did not have a similar champion, despite both a college career and an NFL preseason that should have made him worthy of receiving the opportunity. The Canadians I know are always very quick to tell me to not talk about their country like it is some kind of social democratic paradise, free of oppression. They will be quick to point out all the ways in which Canada falls short of its ideals and has more in common with the worst aspects of the United States than is often acknowledged. I was even accused once of wearing “maple leaf goggles” by a friend in Toronto. Perhaps that is true. But I also know that Malcolm X said, “As long as you are south of the Canadian border, you are South.” Living in a country where “I can’t breathe” has morphed from a man’s dying words to a protest slogan with which thousands identify, it is possible that people just breathe a little easier in the great north. Michael Sam could soon discover that same joy. Like Jackie Robinson, he’ll show just how well he can play without a vocal minority of people psychologically over-invested in his failure.